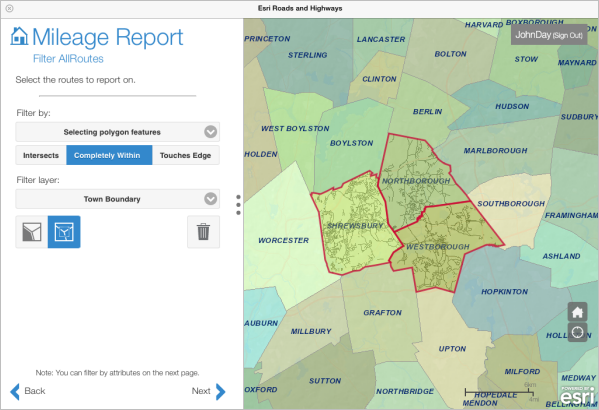 Roadway Reporter is a web application powered by Esri Roads and Highways for Server, which allows you to create mileage, road segment, and road log reports from a mapcentric experience. Roadway Reporter can produce the following types of reports in either PDF or CSV formats. For mileage reports, Roadway Reporter allows you to select a number of attributes from either event layers to report the mile count of those attributes based on a summary field or a set of summary fields. 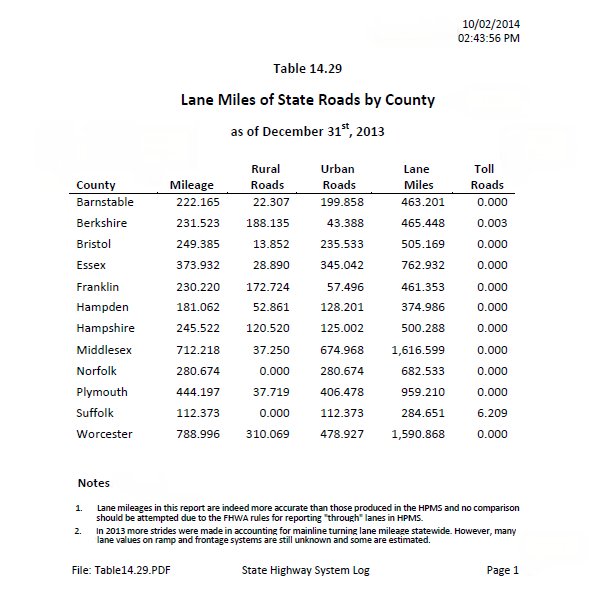 An example is a report that summarizes miles, lane miles, and vehicle miles traveled by county. Sophisticated mileage reports can be configured through the use of spatial filters, attribute filters, and field formulas. For road segment reports, Roadway Reporter allows you to dynamically segment multiple linear event layers together to produce a tabular report that consolidates the event data into one record set. You can filter the routes that are reported by attribute or spatial filters. 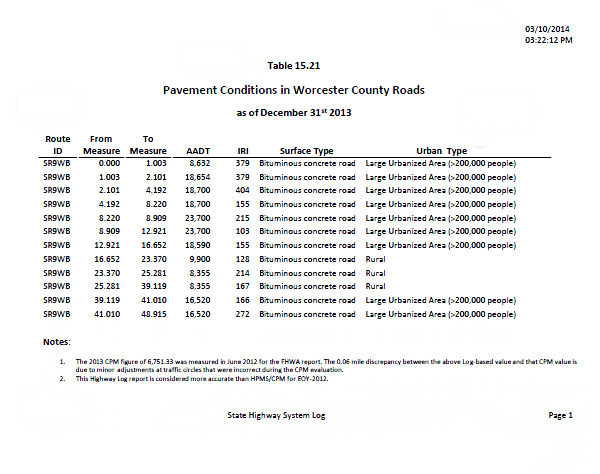 An example is a report showing Annual Average Daily Traffic (AADT), pavement International Roughness Index (IRI), and pavement surface type for roads within a 5-mile radius of a major development that will bring additional traffic to the area. 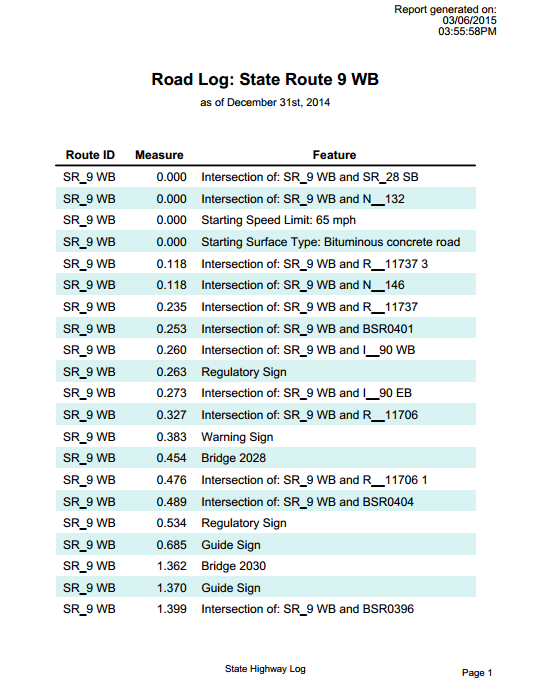 You can use Roadway Reporter to generate a road log report that traverses a route or set of routes and lists the events and intersections that occur in measure order along with the measure at which they occur. These reports can be used by field crews to locate roadway assets by measure for construction, maintenance, and inspection purposes. Roadway Reporter supports generating reports in either Adobe PDF format or as CSV files that can be manipulated further in Microsoft Excel. For reports generated in PDF format, Roadway Reporter supports formatting options to modify layout, fonts, table headers, column order, and more. Roadway Reporter is licensed separately from Esri Roads and Highways for Server.